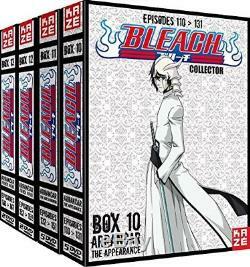 Dvd Bleach - Complete Season 3 - Pack 4 Collector's Boxes - 14 dvds. Description of the product a new threat hangs over the world of the living. New hollows have appeared and threaten the souls of humans, just like those of shinigami, and their power seems to far exceed that of ordinary malevolent spirits, to the point of seriously jeopardizing ichigo and his companions. Isshin and Kisuke will reveal that these new hollows, called arrancars, are actually the fruit of an agreement between their race and aizen who intends to use them to achieve his ends. Their gigantic power would come from the fact that these hollows have managed to acquire the powers traditionally associated with shinigami. These opponents represent a formidable danger ... A situation made even more critical and ironic for ichigo who has more and more difficult to control the hollow that is dormant in him. Included: 14 dvd (episodes 110 to 167) + 4 double-sided posters + 1 cd (bo n ° 3) biography of the director noriyuki abe, is an animation series director born July 19, 1961 in Japan. His achievements are mostly of the shonen type and more specifically of the subgenus nekketsu like yu yu hakusho or bleach. Note the exception of tokyo mew mew, magical girl. After studying architecture at waseda university, noriyuki began his career in animation by integrating the pierrot studio in 1986. In october 1992, abe made his first steps to the realization with yu yu hakusho who will know a great success and will be derived in two films in 1993 and 1994 that will also achieve. He was in the early 2000s one of the most important directors of the studio, with tsuneo kobayashi and hayato date. As of the following year, Abe returns to the genre shonen with detective academy q and especially in 2004 with bleach. This series knows an important success linked to that of the original manga and is even adapted in 4 feature films. Directors: noriyuki abeformat: palaudio: french, japanese, dutch region: region 2 this dvd will probably not be able to be viewed outside of europe. Number of discs: 14studio: dvd output kazedate: May 27, 2015duration: 1414 minutes. This series knows an important success linked to that of the original manga and is even adapted in 4 feature films. Directors: noriyuki abe format: pal audio: french, japanese, dutch region: region 2 this dvd will probably not be able to be viewed outside of europe. Number of discs: 14 studio: kaze date of release of the DVD: May 27, 2015 duration: 1414 minutes. We do not deliver post boxes or military bases, thank you to take into account when ordering. Followed letter - 0.00. Post - international economic mail - 7.90. For more information on delivery, click on more info. Sorry, our products are not available for withdrawal in store. On request, we offer the possibility to pay by bank transfer. No checks will be accepted. The law n 81-766 of August 10, 1981 relative to the price of the book, known as law lang (of the name of jack lang, minister of the culture), is a law establishing a unique price of the book in France. Ask the seller a question. Manga - academy alice (the) vol. Manga - princess sakura vol. Returns are possible for 14 days after receipt of your order. The return costs are the responsibility of the buyer. For an object to be returned, it must be in the same condition as when it was received, the packaging must be present and in good condition (not torn), all parts, accessories and notices must be included in the return. Please note that according to the regulations in force, the right of withdrawal can not be exercised for customizable books, audio recordings, video or computer software unsealed by the customer .. books will not be resumed if they show traces of bends, pages cornea, writings ..
the item "dvd bleach integral season 3 pack 4 boxes collectors 14 dvds" is on sale since Sunday, October 1, 2017. It is in the category "dvd, cinema \ dvd, blu-ray ". The seller is "around_the_clock" and is located in /leans. This item can be shipped to the following country: europe.